After much discussion with several Future Tense Members, we have conceived an innovative new concept to the Future Tense realm so to speak. 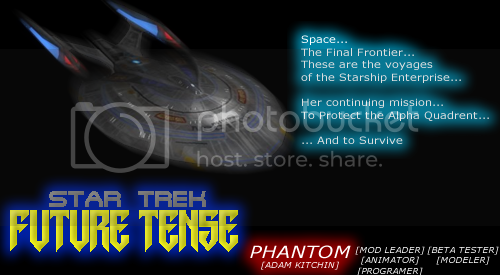 The Future Tense Saga was always planned as a 'Tense Trilogy' only Future Tense III is about to take new form and leave the Armada realm and branch into something even more exciting. Isn't it kinda early to be thinking this far down the road? I had to take time to think about it, but I MIGHT be able to compose the music for Future Tense III (Of course, when the details arrive). I only request that the music isn't used for any other purpose. Future Tense II could most certainly use the help of a composer. FTII will need music to suit 5 races and 5 eras. While something related to the star trek genre is preferred, we are open to ideas and suggestions . It would be fantastic if we could hear examples of your work. You can contact either Adam or myself via email. You can be assured that your work will not be released without explicit permission. Any news on this front of the mod?